Dress Like a Man. Not a Metrosexual. Manliness has been at war for the last few decades. Our diet has slowly changed over that period, changes that have left us with less testosterone. Expectations are that we should be less masculine and more feminine – both from a style and emotional standpoint. Now, there have been welcome changes to that manliness should accept with open arms. We’re more open minded in today’s society than we were in the past. More open to change, new philosophies and new ideas. Men are not neanderthals. At our base we are hunter-gatherers. We are warriors. But we are also loving fathers, brothers, and husbands. Society is turning us into sob-stories. Instead of being the shoulder, we look for one to lean on. Instead of lifting others up and leading, we tear our friends down with gossip and back-talk. And now, more than ever, society is changing how men dress. Let’s take it all back, starting with our clothes. What’s old is new again. For some reason that’s the way the world works in many of its facets. It’s true with training; compound, heavy lifts with free weights are becoming more and more popular. It’s also true with fashion. The Rat Pack-styled suit, with the thin tie, possibly held close by a tie clip, while the pocket square is folded crisply, showing but a centimeter of it’s usually white face. Casual wear is seeing a similar trend. 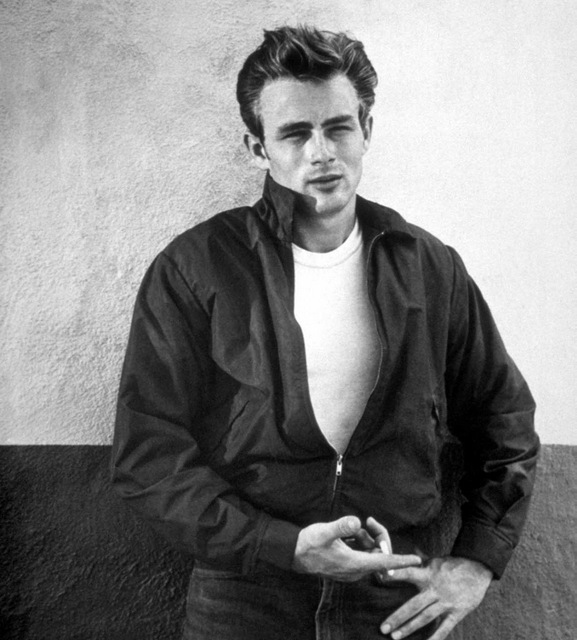 James Dean-like simplicity is poking its head back into men’s fashion – a place where men’s fashion belongs. The V-neck is everywhere, usually in shades or simple colors. T-shirts of the same variety, covered by denim or leather, resting atop jeans or kakis that fit neatly over desert boots. Simplicity, whether it’s for work, casual, summer, or sport, is where a man should focus his attention. It’s in the radical that the metro – or estrosexual male (new word: meaning a man with a bit too much estrogen in his life) creeps his far too preciously groomed face. Television has a profound impact on men’s fashion. Either by following a budding trend, or creating its own, television has brought back old school class with a reckless abandon. 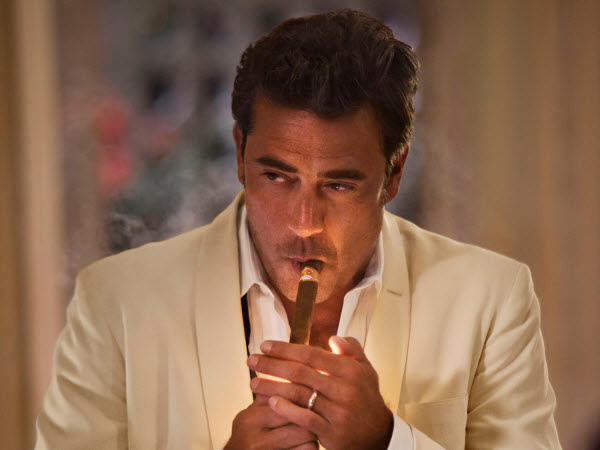 Shows like Mad Men, Boardwalk Empire, or my new favorite Magic City, show men of the past at their finest. White Collar, a show that has brought back old school class through it’s main character’s adoption of a former Rat Pack associate’s wardrobe in one of it’s first episodes. Bringing the old school into present-day fashion in a very literal sense. TV has always influenced how men dress, but the aforementioned shows are leading this trend like never before. Why? Because the real men of yesteryear had style. 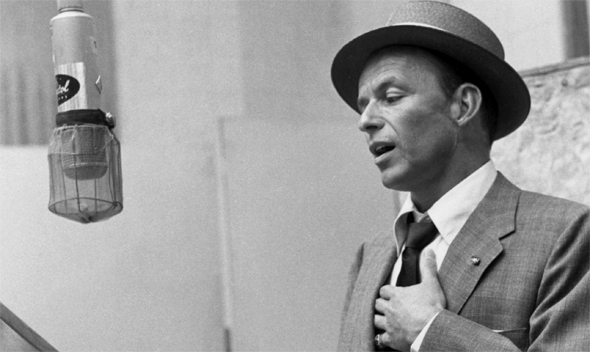 It doesn’t matter if you have an eye for it or not, it’s blatantly recognizable when you see a Sinatra or a Dean. If there’s one thing you’ll notice about the style of the past, is the cut of the clothes. Today, a businessman might spend thousands on the most expensive material for his suit, when he would have been better off spending tens on the right tailor. While having great material for a suit, shirt, or any other article of clothing is nice, it’s also useless if the garment doesn’t fit right. Class, whether in business wear, evening or casual wear, is found in the cut of the cloth, not in the material. No matter what the article, make sure it fits. If all of your clothes fit, you’re going to look great – barring a need to experiment with ugly colors. First things first, invest in a tailor, and tell that tailor to make it fit snug. We’re not after skin tight jeans, shirts, or long-sleeves. That’s an area we’ll leave to the metrosexual. What we want is a snug fit. As you build muscle, this doesn’t change. Just because you’ve packed on a few extra lean pounds, that doesn’t mean you then have the right to wear your clothes as if they’re painted on. Again, snug, not skin-tight. 1. Pants: have a couple pairs of good jeans. Though both should fit snug, leave one un-altered at the boot, then alter the other one. Having one pair a bit longer will go great with boots, while the pair that is altered to your actual specifications will fit better with loafers and dress shoes. Ideally, add a few more colors in there as well, maybe a grey denim pair, and a pair of kakis. 2. Shirts: we can’t tailor t-shirts, just make sure you find one’s that fit. Snug around the arms is good. Also make sure they don’t flair our at the belly. If you’ve done the work to create a v-shaped torso, don’t waist it with a shirt that doesn’t compliment that shape. Also, make sure that your v-neck’s aren’t too tight. You’ll look like a metro. Also, always buy a dress shirt that’s made just for you. You can get them for $70 or even less, but it’s worth it. I only have a couple dress shirts that I wear, both are made to fit my odd measurements (17 inch neck, 29 inch waist) that, if I were to buy off the rack, would leave me with a muffin top – a shirt that puffs out if I try to tuck it in. 3. Suits: let your tailor make you a suit if you can. If you don’t have the funds, buy a suit that fits well, then let your tailor bring it in where he can. This isn’t about being timid. That’s not the point. Where men run into trouble, and venture into that metro-realm, is by over-reaching. Simplicity is a good thing, especially in fashion. 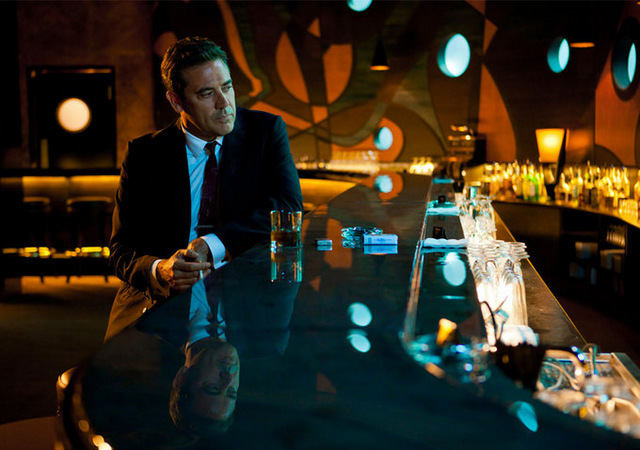 Have a look at the Rat Pack, James Dean, or any of the characters in the aforementioned TV shows. They dress extremely well because their clothes fit, and the colors are subtle. This is true for vocals and for attire. The one wearing screamingly loud, obnoxious colors, is often the one being loud and obnoxious. The one compensating for something. You’re a real man, you have nothing to compensate for. Dress well, not loud. Socks, shirts, ties, pocket squares – if you wear colorful pants, make sure they have a dull tone, don’t go bright read, but maroon. So Don’t Dress Like One. This same principle goes for accessories. I wear a watch on one wrist, and a bracelet on the other. The bracelet is borderline, simplicity is always a good thing. Rings, unless it’s a family or wedding ring – or if you like a big ring as Arnold does – are a no no. As are too many bracelets and necklaces. They’re effeminate. You’re not a pirate, so don’t dress like one. We have to be careful with accessories. There’s a fine line between a feminine-looking hippie/pirate, with his bracelets and necklaces, and a man, between a metro and a guy’s guy. Too many guys today dress more like Johnny Depp in Pirates of the Caribbean, when they should be dressing like he did in Public Enemies. 1. The Watch: I love watches. I lost my favorite one, a Locman Mare with a black leather strap. But have replaced it with a Tourneau, a much dressier watch, that’s also a lot smaller. If you can afford two watches, by all means go ahead. If you can’t, invest in a good one that fits the look you’re going after. Larger, diver’s watches are the rage these days – and I’m a sucker for a Panerai – but if you’re going after the more polished, businessman look, opt for a dressier watch instead. 2. The Bracelet: a bracelet can add some humanity to an “all business” look. Mine is black leather with a silver clasp. If you want to wear a bracelet, keep it classy. Stay away from hemp, frayed material, and anything else you’d find on Captain Jack Sparrow. 1. Shoes: have a pair of boots (desert or chukka are a great start). A pair of brown or black dress shoes are also a necessity. From there, a pair of loafers are always a good choice – Steve Madden has some great selections. Stay away from sneakers with your jeans, unless you’re wearing a hoodie and running errands. 2. Shorts: “A don never wears shorts.” That’s from the Soprano’s, and it’s up to you whether you follow that advice. I wear them, but I’ve never seen John Kennedy, James Dean, or Frank Sinatra in a pair of shorts. When it’s hot, they wear khakis. If you do wear shorts, I opt for either a khaki material or linen. And never wear shorts that venture below your kneecaps. 3. Sweaters: every man needs a few sweaters. I have a bunch of them, and as the fall pops it’s frigid head, I’m prepared. They can be accompanies by slacks or khakis or jeans. Make sure to have a black v-neck sweater, as well as a bigger sweater – grey, with a button up collar is a great choice. 4. Jackets: jackets make the mood. A blazer is an important staple of a men’s wardrobe, as is a peacoat. 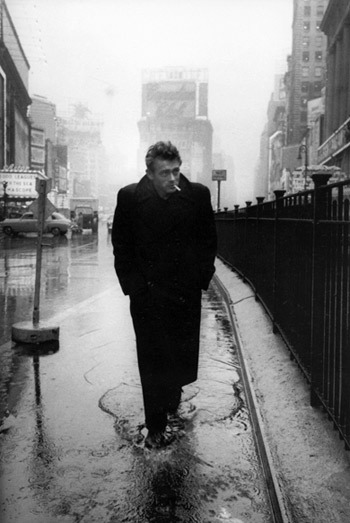 I look to James Dean for the peacoat, with the big collar and double-breasted classic look. I actually bought one that was as close to his as possible. From there, keep things simple. If you want a leather jacket, simple is best. You don’t need a lot of “stuff” draping off of it. No zippers. No mess. Simplicity is class. Courtesy in large part to the generous members of the Be Legendary Facebook Community, check out the following resources to help you in your quest to become a better, smarter, more masculine dresser. Stunning images can lead you to buying a new watch, shoes, or taking a vacation on a whim. 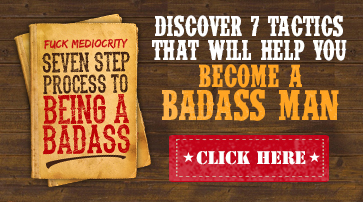 Watch out for this site, it’s awesome, oddly motivating, but addictive as well. Brett McKay, the creator of the Art of Manliness, has done a masterful job creating a hub for all things manly, fashion included. I’ve written articles for them before – like this series on boxing, or how to be your own hero – and it’s definitely a site I’d recommend to any man. Good clothes at great prices. If you’re looking for deals, this is a great place to browse and buy. If you’re struggling, trying to figure out your own style, check out sites like Esquire, GQ, and J. Crew for inspiration. A real man dresses for an admirable purpose. He doesn’t choose his clothes to be loud, or to make a statement, bringing attention to himself in the process. Class is at the core of why and how a man dresses. His clothes fit, he’s well-groomed, but he doesn’t go overboard. Class doesn’t change. It’s what makes a man an original. It’s his attitude. His unwillingness to compromise his values and morals. His wardrobe can be an extension of the man he is, if he does so carefully. Look to the past for inspiration. Look to the effeminate trends of the present for examples of what not to do. It’s a lot easier to dress well than we realize. If our clothes fit well. If we take care of the basics. The mixing and matching is seamless. Dress, then, not like a hippie, someone with no direction or focus. Dress like the man you want to become, and let it come to fruition. Act as if. Be as if. Dress as if you are where you are going to be.